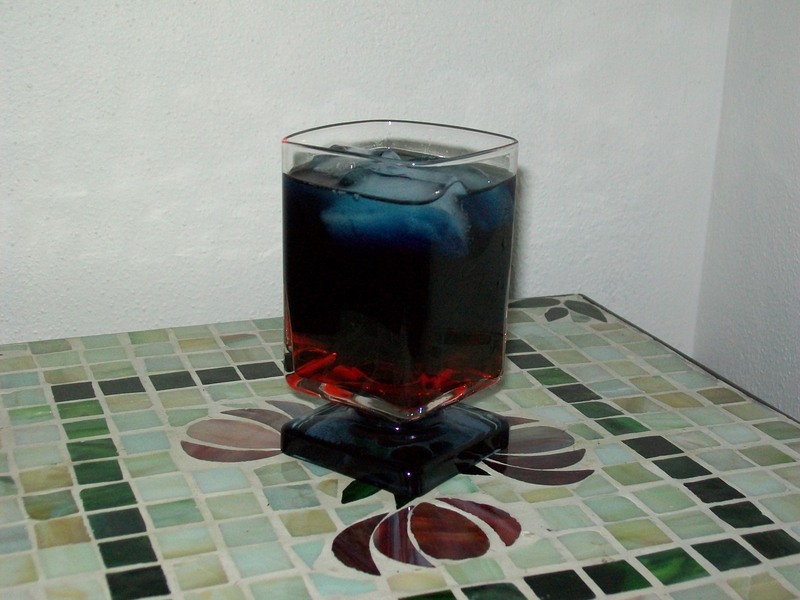 Celebrate the 4th of July with a Red, White & Blue cocktail! What you’ll need: Grenadine, Peach Schnapps, and Blue Curaçao. For a more substantial drink, use either 1 ounce or 1 1/2 ounces of each ingredient. Pour them into your glass (ideally a pousse glass, but a rocks glass or martini glass work just as well) in this easy to remember order: red, white, and blue. Kudos if you can get them to layer one on top of the other. The trick is to slowly pour the schnapps over the back of a spoon held near the top of the grenadine. Then repeat the process with a clean spoon to layer the curaçao on top of the schnapps. Ice is optional. Just be sure to plunk the cubes in gently. How I like it: Over Ice. Mixed is fine. It’s great to serve this drink layered, but does it really matter? Obviously I wasn’t quite able to fully layer the drink! What’s important is the taste. This drink has a nice blend of cherry, peach, and orange flavors. It would be easy to drink a lot of them. Have a safe holiday; drink responsibly!